There aren’t many things I’d go back and change about my life if it was possible. I’m a firm believer in the idea that there is value in all our life experiences. Even the things that seem really ‘shite’ at the time. I wish I had known that habits are the key to putting healthy eating (and other parts of life) on ‘autopilot’. I wish I’d known that habits make healthy choices second nature so you don’t have to ‘think’. It would have saved me so much struggle, effort and pain. But at least I know now. And so do you! The rate of obesity has increased at the same rate as our consumption of processed factory food. Coincidence? I think not. So what is real food? Michael Pollan recommends not eating anything your grandparents wouldn’t recognize as food. But that would rule out sashimi for me! I prefer to think of real food as anything that you can buy without an ‘ingredients list’ on the pack. 2. Having a shopping habit. No, not retail ‘therapy’… Shopping for food. If you’re going to be cooking real food, you need ingredients in the house. Basically once a week I do some sort of food shop. Usually on a Thursday for the supermarket or the fresh produce market in Canberra. Or on Saturday for the farmers market where I stock up on fresh veg and meat direct from the farmers so I know it’s been raised humanely. More recently, I’ve been able to do some of my ‘shopping’ for fresh herbs and veg in my garden – but we’re a long long way from self sufficiency in that arena. With my gestational diabetes I was already in the habit of keeping my meals as low carb as possible. And after learning that unlike most women with GD, my diabetes had decided to hang around for good, I’ve just kept going with the low carb thing. To be honest I really enjoy eating like this. I find the less carbs I eat the less I want to eat them. Plus I’d much rather have healthy stable blood sugar than a bowl of pasta any day. 4. Eating LOTS of fat. If you’ve tried eating low carb and have struggled it was probably because you weren’t eating enough fat. Basically we can either burn carbs or fat for energy. If you choose to avoid the blood sugar roller coaster that comes from eating carbs (especially if you’re diabetic) then you need fat. My favourite fats are home made mayo, grass-fed butter, olive oil, home made chilli oil and coconut oil. Want to know the easiest way to enjoy your food more AND avoid over eating? It may sound like it wouldn’t help, but I’ve found eating mindfully makes a world of difference. It takes some practice but it’s a habit I highly recommend you experiment with. I have two techniques that really help. First I focus on chewing. When I feel the urge to swallow I get myself to chew a few more times. The second technique I learned from my friend Darya Rose is to wait before there is no more food in my mouth before loading up my fork for the next mouthful. So when I pick up my fork I try and remember to check that my mouth is empty. Need some help with your healthy food habits? 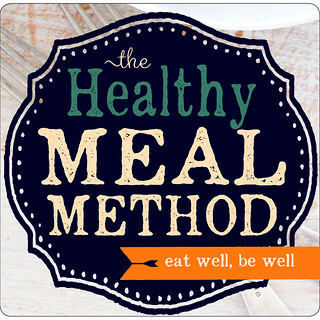 Registration for my online cooking program ‘The Healthy Meal Method’ is still open for a few more days. It’s a 6 week online training program that teaches simple healthy cooking habits. It arms you with simple tools and strategies to help you make real lasting changes to your life so you can ‘eat well, be well’ with minimal effort. Note: Doors close 3 March 2017. This is going to sound like a big call but I’m willing to ‘go there’ anyway. This was my favourite thing on our table this Christmas. Yep better than the deep fried turkey – although only just. Man was that one tasty turkey. But back to the salad, it has such freshness and vibrancy yet the noodles provide the comfort you’d normally expect from a bowl of spaghetti. I’ve been serving it mostly as a side salad this Summer but it would only take a poached egg, some sardines, a generous handful of shaved Parmesan or a little cooked chicken to turn it into a meal. And another thing I love about this salad is that it’s not a ‘delicate flower’ that will wilt if you don’t serve asap. It’s actually happy sitting around at room temperature for an hour or so. And the leftovers keep really well in the fridge! 1. Cut zucchini into spaghetti-like noodles using a spiralizer, vegetable peeler or mandoline. Sprinkle with some fine salt and stand for a few minutes to soften. 2. Combine pesto and lemon in a large bowl. 3. 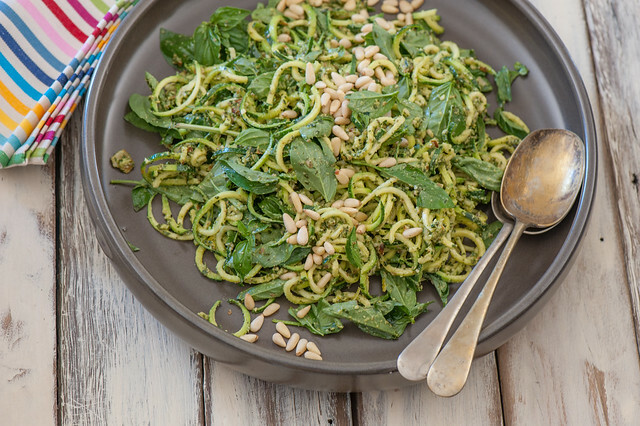 Toss zucchini noodles in the pesto dressing along with the basil. Taste and adjust seasoning with more salt or lemon, as needed. 4. Serve with pine nuts scattered on top. 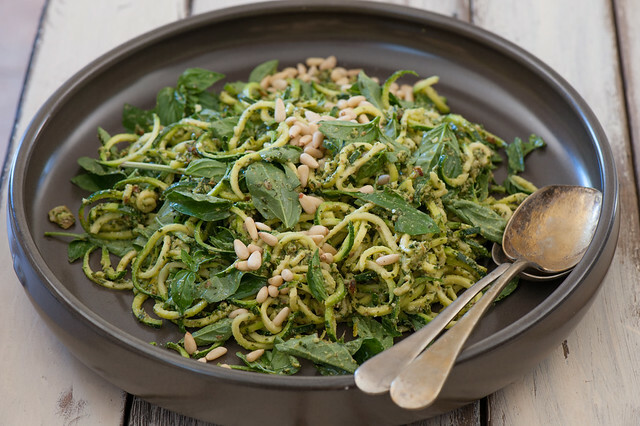 dairy-free – use a dairy-free pesto or basil oil. carb lovers / more substantial – toss in some torn sourdough croutons, boiled new potatoes or cooked spaghetti. complete meal – add some protein like poached eggs, some sardines, canned tuna, a generous handful of shaved parmesan or feta, or a little cooked shredded chicken. different herbs – if it isn’t basil season use flat leaf parsley, mint or some salad leaves instead – you just want some leafy fresh greenness. different nuts – pine nuts can be expensive so feel free to use almonds, brazil nuts or cashews instead. nut-free – skip the pine nuts or use shaved parmesan, crumbled feta or slices of fresh goats cheese instead. Hi Jules – I enjoy your posts and recipes, but there was one thing in this one I felt I had to comment on. You recommend grass-fed butter. I’m so pleased to see butter (and other dairy products) back on the menu, but please – just simply recommend good Australian butter. You would be hard pressed to find butter from Australia that is NOT grass-fed. It is the nature of the dairy industry here that cows are kept outside and eat grass. It contributes to our competitive advantage on the world dairy scene. By recommending grass-fed butter, there is an implication that most of our cows are not grass-fed, and that leads people to think of factory farming and animal cruelty. The facts are far from this scenario in Australia! Thanks for your comment. You know I’ve often wondered about the state of the Australian dairy industry.. so good to know that most of our cows are grass-fed. However the Stonesoup readership is global so I think it’s still important to make the distinction. When you say sardines, do you mean the tinned high-salt sardines I find in US grocery stores? Or do you mean fresh or tinned but not salted sardines? Or maybe even frozen? I mean tinned ones Natalie… mine are in olive oil and I’m not so worried about the sodium. But you could easily cook your own fresh or frozen ones. Hi Jules, this Zucchini dish looks great. Though I’m a bit minimalist, I’m thinking of investing in a spiralizer. Any recommendations? I’m after a simple, handheld one.. preferably minimal plastic. I wouldn’t get a handheld one Cass – I did at first and it was really tough on the wrists. Mine is a Paderno and I love it because it packs away into a little box. I’m a minimalist too especially with kitchen equipment but I haven’t regretted my spiralizer.